I asked my housemate Fred to write up the recipe for his pakoras since they were such a big hit at our Indian themed community dinner. Lucky for us he agreed to, so what follows is the recipe he used to make them. If you are having any sort of party (or just want to celebrate life) I highly recommend these little snacks! What on earth is a pakora? A pakora is generally a vegetable dipped in a seasoned garbanzo flour or graham flour based batter, and deep fried. 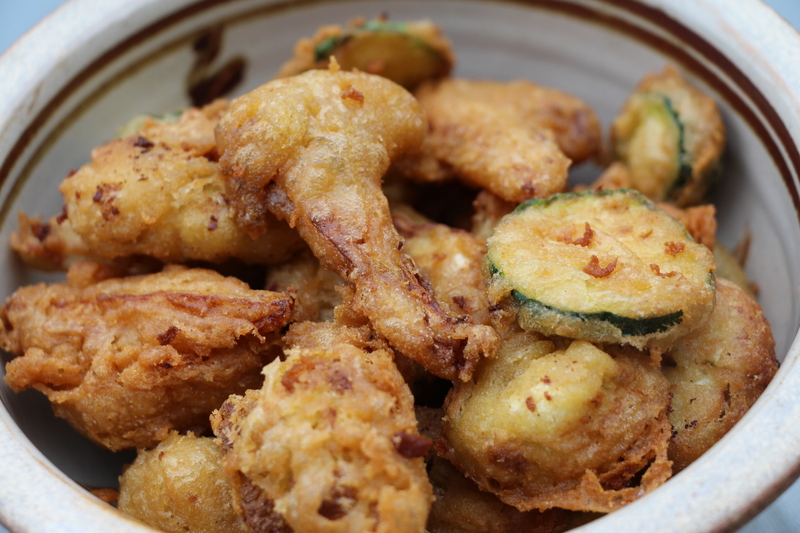 Pakoras are relatively easy and fun to make, and are certain to be a crowd pleaser even among children who aren’t too fond of vegetables or even those who don’t have much of a taste for Indian food. You may eat them with your fingers as a snack, or as an accompaniment to a sumptuous banquet, or anything else along the spectrum of the meal scale. This recipe has been adapted from Lord Krishna’s Cuisine; The Art of Indian Vegetarian Cooking. 2 teaspoons of your favorite oil. Oil for deep frying. I used XVOO (extra virgin olive oil). Mix the flour with the salt and the 2 tsps of oil and coriander powder and ginger powder and baking powder. Add a few tablespoons of water and mix thoroughly. Continue to add water until the consistency is like that of heavy cream. (consistency is important for proper cooking!) let sit for 10-15 mins and stir again to check consistency is still right. Dip 5 or 6 quartered cauliflower flowerets or zucchini half moons into the batter, letting the excess drip off, and then one at a time carefully place into the hot oil. Fry until golden brown. Take out and put in a colander or on a plate with a paper towel or cloth towel to absorb the excess oil. STEP 4: Serve immediately! (after letting cool enough to safely consume) or keep warm for a little while until ready to serve. Note: If you want to increase the experience, you can make some sort of a ‘yogurt-ish’ dipping sauce including shredded cucumbers, cilantro, salt, tomatoes, or something along these lines. Or vegenaise. They will be very enjoyable without a dipping sauce as well. Here’s the next post in what seems to be a series of kohlrabi recipes….what can I say, it’s new love (-: Anyway, I brought this to a picnic and everyone seemed to love it, so why don’t you give it a try? Mix all ingredients in a large Tupperware and let sit to soak in the flavors. Add more olive oil and soy sauce if you need it, you are looking to have enough liquid to coat the kohlrabi. Depending on the Tupperware you chose, you can also shake it every so often to get the liquid to coat the kohlrabi on top. After the kohlrabi has marinated, or while it is marinating, heat up the barbecue (or go to someone else’s picnic). 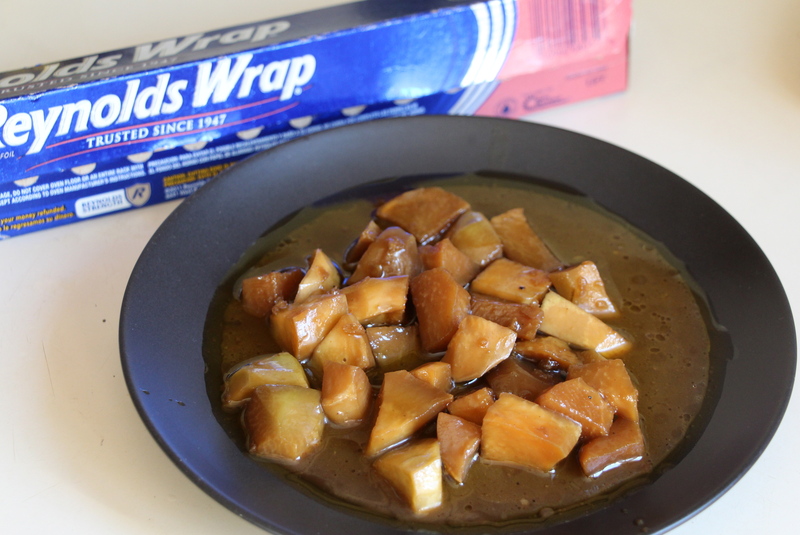 Spoon the kohlrabi into tinfoil (I split it in half so it didn’t get to big) and place on the barbecue. Grill the kohlrabi until it is really soft and has some golden brown spots and then transfer back to the Tupperware full of marinade and serve warm. Enjoy!